Mass-grown cauliflower is pushed on with nitrogen for rapid development, but mushy florets. Our organic cauliflower is different: grown slowly on mineral-rich soil. 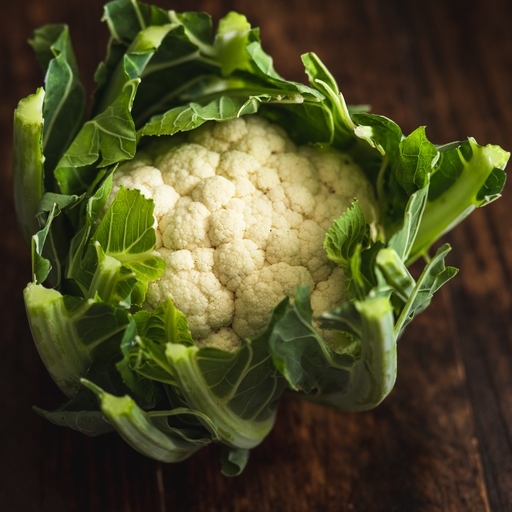 This produces smaller, firmer caulis with exceptional flavour and crunch. Don’t forget to eat the sweet, tender leaves too! Veg up your diet with cauliflower rice or used as a low-carb topping for cottage pie. Or go for full-on comfort with cauliflower cheese – to make it a full meal we like throwing in a good dollop of mustard, a bit of smoked fish, bacon or chopped hard-boiled eggs (usually not all at the same time!). Keep in the fridge – they can last up to a fortnight. We can grow cauliflower in the UK all year round, but you’ll see it in your box mainly from October to May. Cauliflower grows very well on our co-op farmers’ coastal fields in Devon and Cornwall. Our experienced 'A team' of pickers judge when it's exactly the right shape and size to harvest.